What is 5 G ? "I don't know -:)." was the answer to this question when I first wrote this page in mid 2013 and the answer hasn't changed until the mid 2016. From late 2016 many things started happening in 3GPP and now (Mar 2017) we got several TRs (38.801, 38.802, 38.803, 38.804) that describes the details of technical requirement to be specified in formal NR(5G) specification, meaning that now we know what 5G (NR) will look like in pretty much detail. If you want to get the formal 3GPP definition right away, just jump to Formal (3GPP) Definition but I will keep all of the other definitions as well in case when you are interested in tracking down what kind of vision multiple major players had and how those visions has been consolidated into the formal definition (requirement). 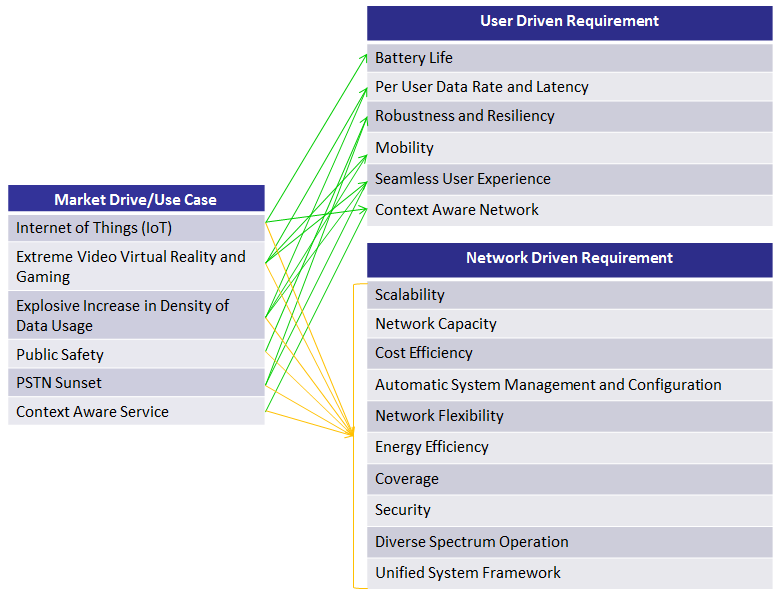 Nothing about 5G is defined officially in any standard organization as of now. 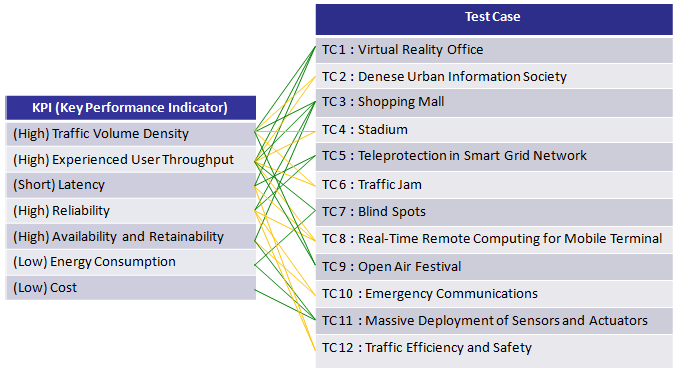 However there are several organization that describes key technical component or key performance indicator (KPI) that may envision on what 5G will be like. I would put the list of features from several different organization. At least, one thing for sure will be that the data rate will be at least several G bps. (The final goal of 4G data rate is 1 Ghz and we still have a long way to go to achieve this 1Gb rate). Followings are some of my personsl keywords about the 5G reading through most of these papers. Extremly High Data Rate By far, we don't know yet (as of Nov 2015) what would be the maximum throughput. But I think it will be targeted to be at least around 10 Gbps. Extremly Low Data Rate Just achieving the extermly low throughput has no technical problem. But critical technological issue is that achieving the extremely low data rate with extremly low cost and extremely low energy (battery) consumption. 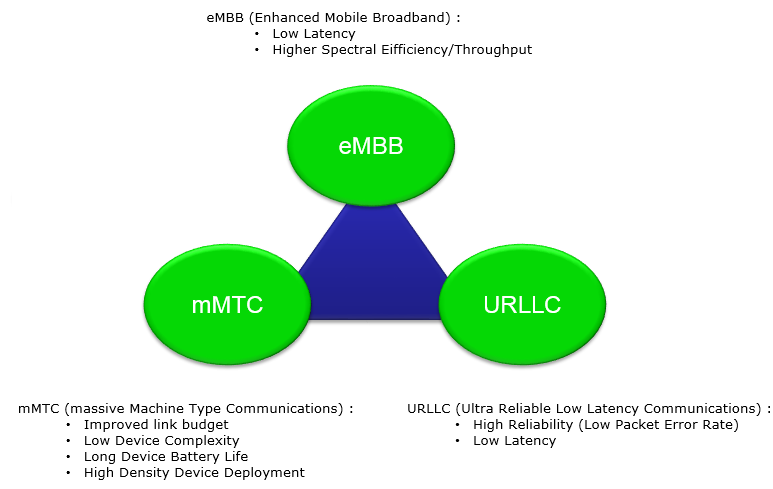 Refer to MTC criteria for the details. The words 'High Frequency' or 'Low Frequency' can be misleading because it would be a relative concept, but I say 'Super High Frequency' comparing to current cellular communication frequency (mostly under 3 Ghz). By far (as of Nov 2015), the most frequently commented frequenty blocks are 6 Ghz, 15 Ghz, 20~30Ghz and the highest frequency being tried is a little bit over 70 Ghz. The words 'Wide Bandwidth' or 'Narrow Bandwidth' can be misleading because it would be a relative concept, but I say 'Super Wide Bandwidth' comparing to current cellular communication bandwidth (100 MHz, ideal max in 4G). The most commonly mentioned bandwidths are 160 Mhz, 400 Mhz, 800 Mhz. Currently the widest bandwidth being mentioned are 2 Ghz bandwidth. 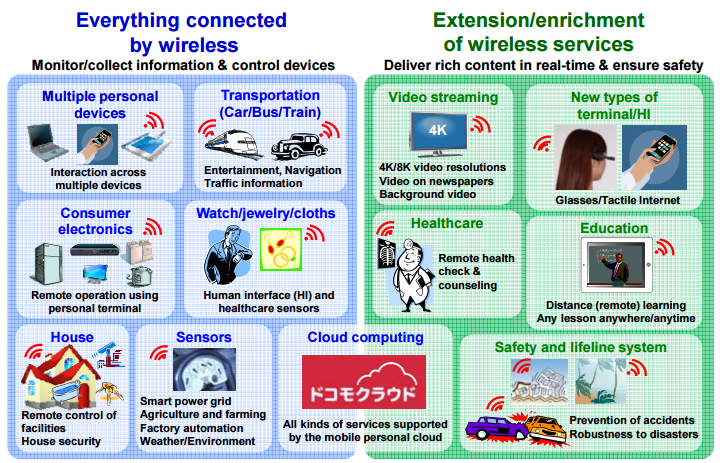 Recently (as of Jun 2016) there has been a couple of RAN meeting with major focus on 5G and several official technical terms has been defined. The first thing to be defined would be 'what is the name that refers to the whole 5G technology ?'. As we call 4G as LTE, there must be similar name for 5G. What is it ? At least for now, the official name for 5G is NR that stands for New Radio. (I already see many people saying NR is not a proper name because 5G does not refers only to Radio Technology.. but anyway for now, NR is the official term. Then what is official definition of NR. Since there is no single line official definition for LTE, there is no single line official definition for NR. But in my personal definition, I would say 'NR is a collection of technology from Physical layer to Core Network that need to achieve the followiing three major feature (requirement) as illustrated below. The term shown in this diagrams are also formal 3GPP terms and you will see these terms in most of the 3GPP documents on NR. So it would be good for you to get familiar with these terminologies. Before you read, just enjoy these video clips and let your brain build up its own intuition(Insight). More organized and formal definition can be made from METIS which were proposed in Aug, 2013. Even though METIS does not put forth explicit 'definition', it proposes several KPI (Key Performance Indicator). I think we can say "A communication system satisfying the METIS KPI can be categorized as 5G". Ability to fulfil these requirements under a similar cost and energy dissipation per area as in today�s cellular systems. 5GNOW does not decribe much about high level definition or use model of 5G. I guess any 5G high level definition fall into the scope of METIS definition/use model. 5GNOW discuss more on lower level impelmentation of 5G. Key implementation Item discussed/proposed by 5GNOW is as follows. Think on your own why these would be issues and then refer to 5GNOW Deliverable Documents. NFV-based Virtualied Core Network Operation Techniques to build the cloud by virtualizing a standard hardware and operate a range of networ/service functions on the software-based network. Virtualized RAN Techniques to centralize and virtualize DU(Digital Unit) of a base station into a standard HW based cloud and process RAN signals in real time. Beam Switching/Tracking Techniques that provides an optimal link by selecting an optimal beam out of many or changing the direction of the antenna beam according to the location of the user. The contents in this section is based on the WhitePaper : 4G Americas' Recommendations on 5G Requirements and Solutions. This trend is mainly represented as M2M, MTC, IoT these days. Actually each component technology is already available and has been adopted by various area, but they hasn't been integrated across wide area. We need a flexible cellular network that can integrate all of these diverse component and 5G will be playing a crucial role for this. These are emerging technolgies meaning relatively new technology, but development/implementation for each components has been adopted for a while. But this hasn't been a target for cellular communication since the required data rate is too high. To connect these applications to cellular network, we need a new celluar technology that support extermely high data rate. This extremly high data rate will be one of the key feature of 5G.